Papertrey Ink Tag w/a tag Challenge. 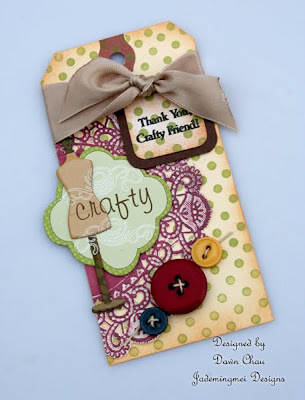 I actually had this tag made before yesterday's card, so I was happy when I saw today's challenge on tags! On a recent trip to the LSS I found these packages of fun/crafty chipboard. This set also includes buttons (not the ones used here), knitting needles, and balls of yarn. I think these would also make some unique tags for a handmade blanket or scarf....my sister is probably reading this and is going to remind me that I have yet to make the tags she requested...a year ago! Jillybean, I was just "waiting" for the right embellishments to come along ;) I distressed my manila tag, used Polka Dot Basics in olive green, rubbed plum ink over my white doily, added my chipboard, buttons, and tag sentiment is from Studio Style. Very cute...and what a great idea to ink the doily!! You ARE amazin'! Challenged completed already and it's not even 9am! This is gorgeous my crafty friend. 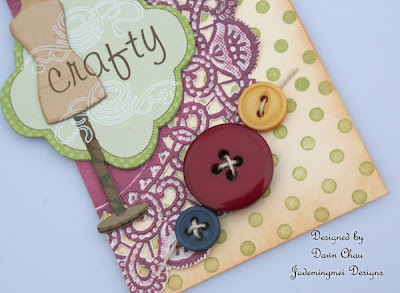 Love the doily too and that stamp is SAWEEET! Thanks Diane! I don't know what it is about WHITE doilies, but they scare me! I'm timid to work with all white. Donna--I'm not THAT ambitious in the morning...I actually made the tag yesterday, in between trying to "fix" my card for the button challenge. I just put the card aside and work on something else. This is really nice, love how you changed the color of the doily. Lots of great elements to this tag, I really liked it.